Because of the cost involved and maybe the inventor's lack of desire to complete the fairly complex procedures involved in obtaining a patent, a good number of ideas were not actually patented. Another reason affecting this was that an Act of Parliament in 1852 declared that the grant of patents was dependent on the inventor paying £50 after the third year of issue and £100 after seven years. If these duties were not paid the patents became void and so were lost. Of 2,047 patents granted between October 1852 to June 1853 this happened to around 2/3rds of the patents belonging to those who failed to pay. 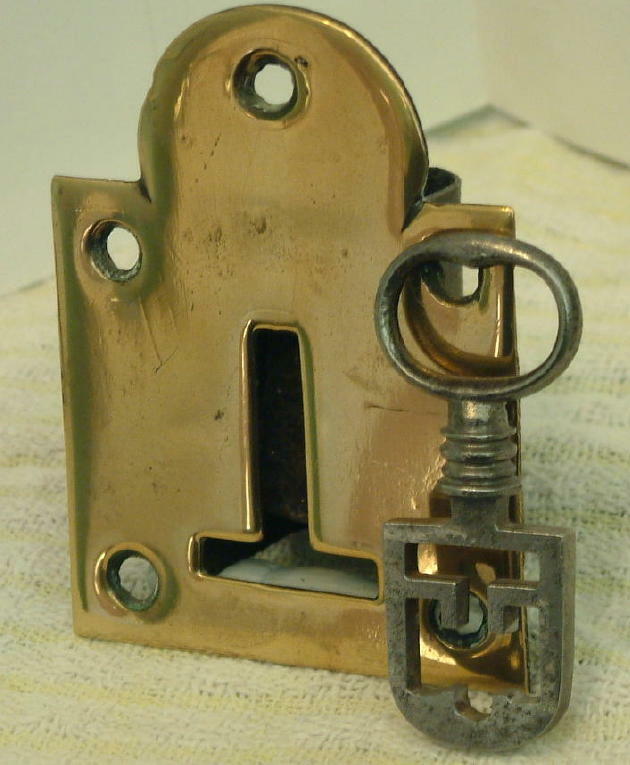 This brass plate would probably be fitted in a wood case with a latch above. 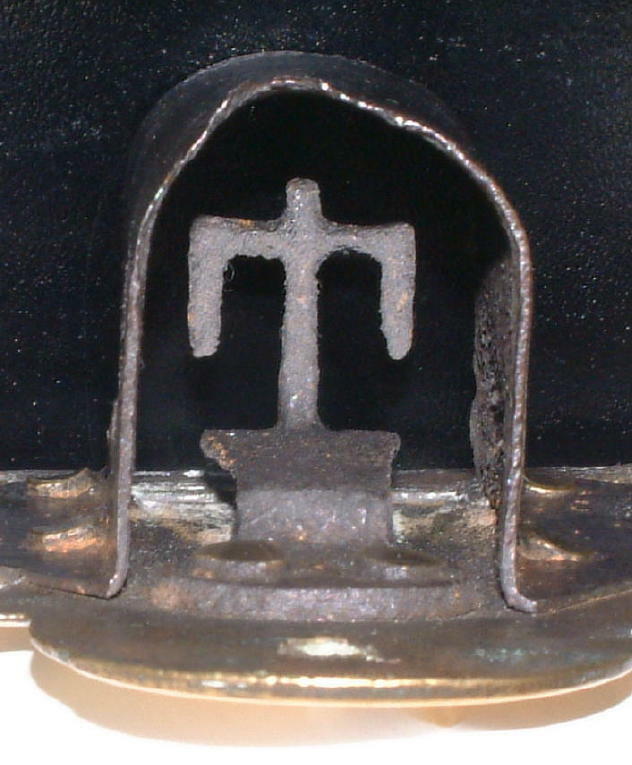 Back plate with the ward through which the key has to pass. As George Price comments in his Treatise on Locks of 1856 “The peculiarity of the construction consists of a large tongue, which drops down behind the keyhole, and has merely to be lifted up to unlock. 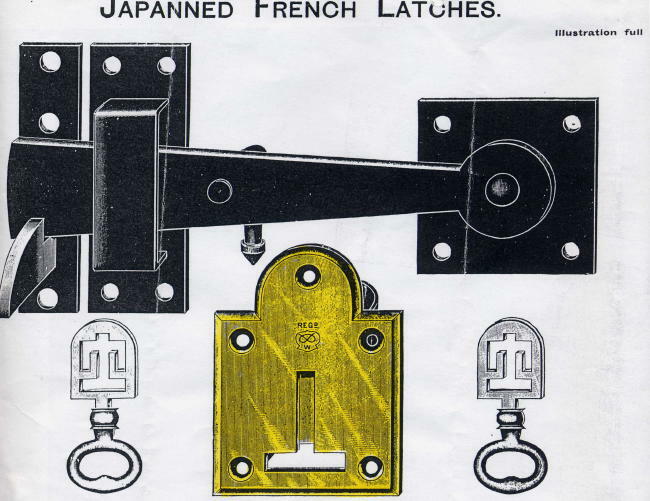 This is the night-latch, which gentlemen who have lost their keys open with their address cards – a very convenient substitute when used by themselves, but not a very desirable safe-guard to the domicle”! The lock had a short period of general use between 1810 to 1820 before falling out of favour. However it continued to be made by manufacturers at least to 1914 as shown in the extract below from the catalogue of B. Walters & Company Ltd of North Street, Wolverhampton that year. This is a point to bear in mind when considering the purchase of these keys, which tend to have a fairly high price because of their conceived antiquity.